A beautiful new luxury mountain lodge. Just 150 meters to the slopes, Villa El Cielo is the newest addition to the Hakuba Company's accommodation portfolio. The grand opening was in July 2018. The wide living area with a 5 m high ceiling provides you a relaxing stay in the forest. The design allows 2 families or a small group of people to live in privacy. Each private area is connected with the living room, which creates a perfect balance between privacy and relationship bond. A south facing wooden deck allows guests to enjoy tremendous forest views. There are 3 bedrooms set with twin semi-double beds. 3 shower rooms in total, one of them has bathtub set at a location that can overlook the forest. If there is over 6 people staying, the villa is also prepared with wall hidden bed and futons in the loft. The kitchen is the latest model, fully equipped with all kinds of cookware, tableware and glasses. There are also 2 laundries and 2 ski lockers for bigger groups. The villa is near the world famous Happo-one ski resort. The nearest chairlift, Sakka Slope, is just 150m away and in easy walking distance. Also easily accessable are the other ski resorts by taking the convenient shuttle bus. The wonderful restaurants in the Wadano area are also mostly in walkable distance. 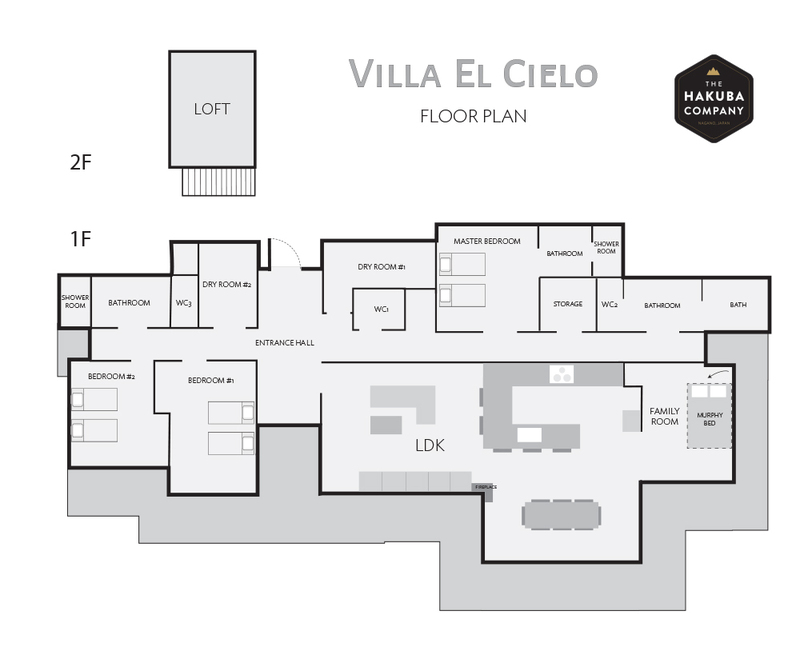 Villa El Cielo is designed with a complicated shaped roof to create a maximum 5.2m high ceiling living room, with a loft area. All timber cladding walls, indoor and outdoor, are done with red cedar, with only one wall in the main area coated by rock to create accent. The elegant style makes for a stylish villa in the forest, please enjoy your time here. The concierge service of the Hakuba company will make sure everything you need is in order during your stay, please do not hesitate to ask us any question. We also provide inner-Hakuba shuttle service to arrange a stress free arrival and departure. Our staff will introduce you to the facilities upon checking-in to Villa El Cielo. Please note that the staff will not be there the whole day, please give us your travel details in advance.